The Investment Cast Cutting Machine with Hydro-Clamp technology mimics the motions required to cut castings. Axis 1 the Hydro-Clamp assembly rotates manually 360 degrees, clockwise or counterclockwise. Axis 2 the Hydro-Clamp assembly pivots 180 degrees to the left or right. Axis 3 the abrasive wheel arbor raises and lowers for wheel height adjustment. Axis 4 the Hydro-Clamp upper carriage moves left and right. Axis 5 the Hydro-Clamp lower carriage moves in and out. 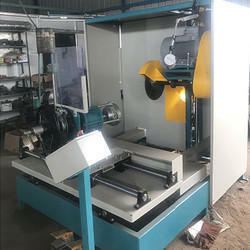 Looking for Investment Cast Cutting Machine ?